My father was a student at the Naval War College in 1974, so I lived in Newport, RI for one year when I was 12 years old, which happened to coincide with the America’s Cup Race that same year. I fell in love with the idea of sailing that year, but it was another 18 years before I ever stepped aboard a sailboat! On one of my first charters, sailing in St. Martin, my friends and I ended up wrapping our jib sheet around our propeller on a 51 foot sailboat an hour before sunset and not yet in our anchorage for the night. This only compounded an unrelated earlier incident in which I slipped on the forward deck and tore my Medial Collateral Ligament (MCL) in my right knee (confirmed a month later by an MRI). How we resolved this is a whole other story (but we did!). If you don’t feel ready, double check, especially at the beginning of your trip. You don’t know the boat yet. Walk through the entire boat. Be patient. It will pay dividends you may never know by avoiding problems before they can arise. You are NEVER too old to start sailing! I didn’t start until I was in my thirties, and was well into my forties before I ever got onto “big” boats. 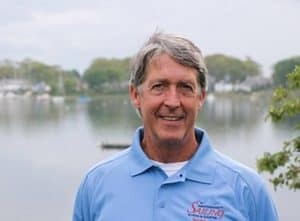 I have learned so much and had so many experiences in only the past 20 years; racing, chartering, captaining charters, teaching and delivering sailboats. Ignore anyone who tells you that you either have it or you don’t (to learn to sail). People learn differently. Plainly and simply, if you have the passion to learn how to sail, you will sail! Those who start off slowly, absorb material and tactile learning differently than those who “get it” quickly. I’ve seen many slower starters become some of the best sailors, because once their foundation of knowledge and experience is strong, they can build on that base quickly. 5. Outside of sailing, what is something that you love to do; something that makes you feel alive? I love to break complex ideas into easily explained parts, and show others how those simpler ideas can then be combined into what was formerly thought to be very complex. I like to teach and share experiences. Teaching, combined with sailing… It doesn’t get much better for me. Captain Glen was a State Trooper for decades, and now does boat deliveries, sailing classes, and a number of other interesting pursuits. Extensive sailing experience coupled with a quiet intensity he coaches his students to achieve more than they thought they could. Note: In addition to Glenn’s ASA teaching credentials, he has also taken and passed the Celestial Navigation course (ASA 107) and the Offshore Passage Making course (ASA 108).